Two people were killed and at least 12 others were injured in weekend violence across Chicago, police said. A 28-year-old man was killed after being shot in the 4100 block of West 16th Street in the Lawndale neighborhood just before 2 p.m. Sunday. The man was shot in the chest after someone in a grey minivan opened fire at him. Police said the man was taken to Mount Sinai hospital where he was later pronounced dead. Around 3 p.m. Saturday, a 17-year-old boy was fatally shot in the 3900 block of South Prairie Avenue. Few details were released surrounding the shooting but officials said the incident appears to be gang-related. The teen was shot in the head and taken to John H. Stroger Jr. Hospital of Cook County in critical condition but was later pronounced dead. On Sunday, a 29-year-old man walked into Mount Sinai Hospital with a gunshot wound to the left hand. He was listed in good condition and told police he was shot in the 1800 block of West 16th Street. An 18-year-old boy was shot in the ankle in the 6900 block of South Eggleston Avenue just after 11:30 a.m., police said. The teen was taken to John H. Stroger Jr. Hospital of Cook County in good condition. The teen told police he was walking on the street when a red car approached and someone inside the vehicle opened fire. A 30-year-old man was shot around 2:15 a.m. in the 4100 block of West Adams Street. The victim told police a man exited a gangway and fired shots in his direction. The victim was taken to Mount Sinai Hospital with wounds to the leg and foot. He was last listed in stable condition. Also on Sunday, two people were shot on area expressways within two hours, according to authorities. Around 3 a.m., a driver was shot on the city’s South Side while traveling on the Dan Ryan Expressway between 76th and 79th streets, according to Illinois State Police. The driver exited his vehicle at the 79th Street exit and called 911, officials said. Another person inside the vehicle then drove away in the car. The victim, whose age was not immediately known, was transported to Advocate Christ Medical Center for treatment. About two hours earlier, a man was shot on the outbound Kennedy Expressway on the city’s West Side. 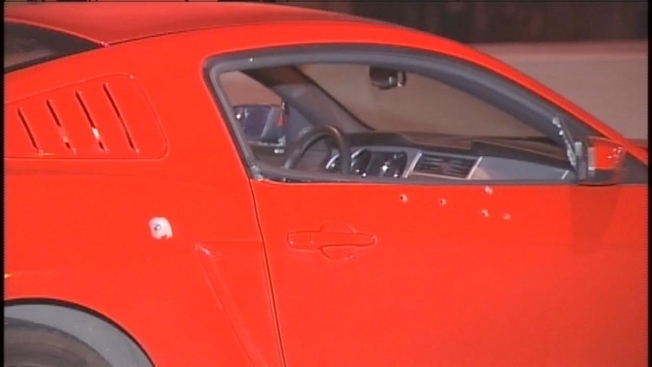 The man, whose age was not immediately known, was traveling in a red Ford Mustang northbound near Fullerton when a car pulled alongside and someone opened fire, state police said. The victim was taken to Illinois Masonic Medical Center with several gunshot wounds. His condition was not immediately known. On Saturday, a man was wounded in a police-involved shooting after he allegedly hit a squad car with his vehicle and attempted to flee. Police said the incident took place in the 2300 block of West Lake around 10:15 p.m. The officer was transported to Northwestern Memorial Hospital where his injuries were believed to be non-life threatening. The offender was shot multiple times and was taken to an area hospital. Around 12:40 p.m., a 39-year-old man was shot during an attempted robbery in the 5600 block of South Prairie Avenue. The man was getting out of his car when another man walked up and announced a robbery, according to Chicago Police News Affairs Officer Janel Sedevic. The victim was shot in the stomach and the man fled the scene. It was not immediately clear if he stole anything from the victim, police said. The victim was taken to Mount Sinai Hospital in stable condition. Around 1:30 a.m. Saturday, two people were shot while inside a building in the 1800 block of West 87th Street. Police said a shooter fired from outside the building and two victims suffered graze wounds. A 23-year-old woman suffered a graze wound to the leg while a 42-year-old man was grazed in the head by a bullet. The woman refused treatment at the scene and the man walked into Advocate Christ Medical Center where he was listed in good condition. On Friday night, a 27-year-old man was shot on the city’s West Side. The man was standing on the 1700 block of North Mason Avenue with a group of friends when a man walked up and opened fire. The victim was shot in the arm and leg and was taken to West Suburban Medical Center in good condition.